Loan star Reece James is desperately hoping his remarkable year with Wigan Athletic is making its way back to Chelsea. 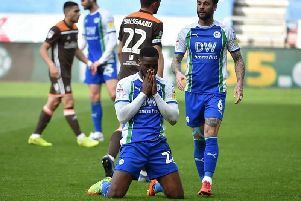 The 19-year-old had another fine game at the weekend as Latics picked up another priceless point towards their survival target via a goalless draw against Brentford. Having represented England at England Under-20 level during his year at Latics, James is targeting an assault on the Chelsea first-team picture next term. “It’s a great feeling to play week in, week out in a good league and to play on the international stage as well,” he said. “My ambition is to play for Chelsea, and every day I work hard to get there. “I was a fan as a kid...my heroes growing up were (Frank) Lampard, (John) Terry and (Didier) Drogba. James arrived at Wigan last summer having yet to play a senior game, but immediately nailed down the right-back role. However, in recent weeks, his importance to the cause has seen him switched to central midfield alongside skipper Sam Morsy, and he’s taken to it like a duck to water. “I’m normally a right back but, if I get told to play another position, I’m not fazed by it,” he said. “I will do it...as long as I’m on the field I’m happy. James came within a fingernail of scoring the goal of this or any other season, when his out-of-nowhere 35-yard effort on Saturday was touched over the bar by back-pedaling goalkeeper Luke Daniels. But was it a mishit cross? Not a bit of it! “I’ve tried a few of them before and, when it lands up like that, sometimes it’s harder to take a touch than to hit it as I did,” he revealed.